For Your New Commercial TPO Roofing, Contact Us At Roofworx Today! TPO roofing has been one of the most praised single-ply roofing membranes in the roofing industry for its outstanding benefits. 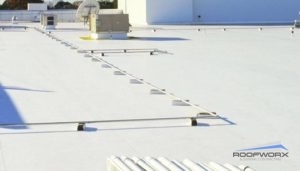 Thermoplastic polyolefin (TPO) is a durable, lightweight membrane used on flat roofs. It is a popular single-ply material for roofing due to its versatility, low installation costs, and ‘cool roof’ capabilities. It comes highly recommended as a non-toxic and environment-friendly roofing material. If you are in the market for a new roof for your office, call us today 817-920-5974 to learn more about TPO roofing in Forth Worth and Dallas, TX! Find Out How TPO Roofing Can Benefit Your Commercial Property – Contact Roofworx Today! What makes a TPO roofing attractive to commercial businesses is its reasonable cost for installation and energy efficiency. TPO roofing is available in the standard set of reflective colors (black, grey and white), and the addition of TPO is recommended by our roofing professionals who are servicing a current roof repair or replacement. Additionally, TPO is resistant to mold growth, tears, and punctures within its structure. After installation and reinforcement, TPO membranes expand and contract with the building more effectively than other single-ply roofing membranes. TPO is recommended by Roofworx to have a proper roof coating on top after installation to prevent against chalking over time. If you are interested in TPO, or another flat roofing material, you can count on the professionals at Roofworx to recommend the right roofing for you. 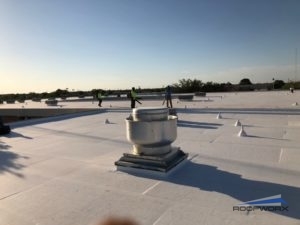 To make your commercial property roof last for as long as possible, include routine maintenance and service, and you will be able to expand your roof’s lifespan. Interested in giving your office roof the lifespan it deserves? Call us today 817-920-5974 to learn more about TPO roofing in Fort Worth and Dallas, TX. We can assist you with installing and repairing the roof of your commercial building! Get in touch and we’ll inspect the current state of your roof to determine the best solution for getting it back in great condition. Updated on August 1, 2018 at 2:43 pm by Roofworx & General Contracting.